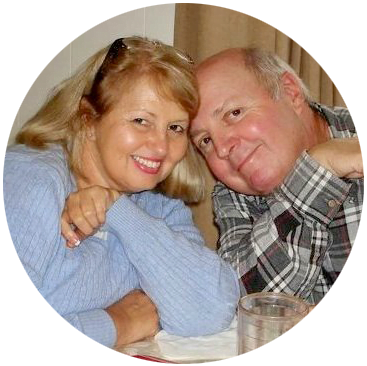 You are here: Home / All Things Creative / All Things Creative-Pumpkins and Gourds! In just a few days, it’s officially going to be fall! Are you ready? 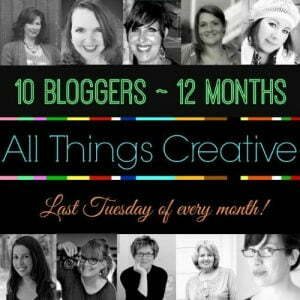 The All Things Creative Group is back with a bonus edition of All Things Pumpkins and Gourds! We’ve looked into our archives and found over 50 decorating ideas, recipes, and crafts involving pumpkins and gourds, and we’ve put them all together here so you can find them easily. But first, let me introduce you to my team. You guys know that we grow both pumpkins and gourds in our garden, right? Well, in case you didn’t, here’s a post I did last year about our little experiment in growing white pumpkins. 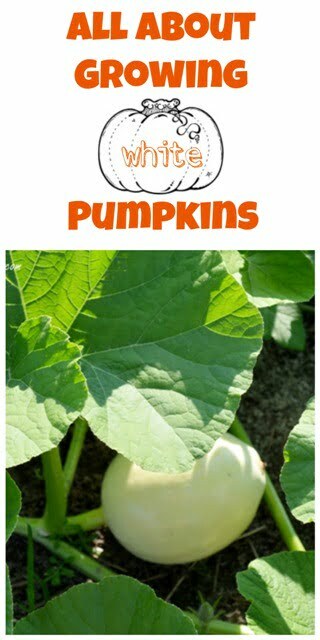 This post will tell you all about how to grow white pumpkins, just in case you decide to grow some of your own one day! And you can see how I used some of those white pumpkins in decorating last year in our post White Pumpkin Reflections. Some of the pumpkins were used at a wedding, and some of the seeds that I saved are growing in the garden right now. Now, I know we can’t all grow our own pumpkins and gourds, but we sure can make those cheap plastic gourds and pumpkins look a lot better by painting them. See how to get this finish by reading my post How to Burnish Cheap Plastic Gourds and Pumpkins. Over the summer, some decorative gourds grew in our garden, and I tucked them into these window boxes to give them some fall flair. You can read all about it in the post Using Gourds in Fall Window Boxes. 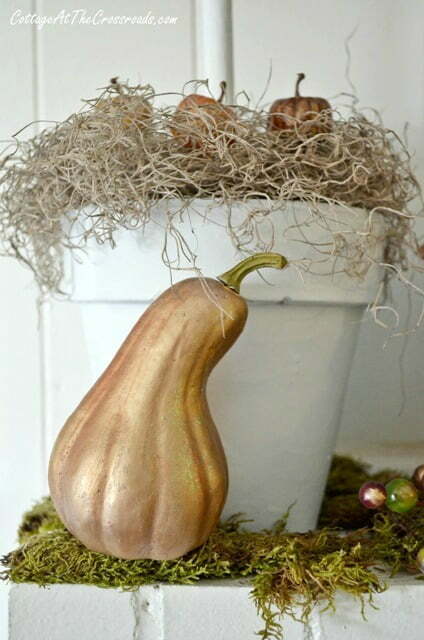 And just recently, I polished these up and used these Gourds on Our Fall Mantel. 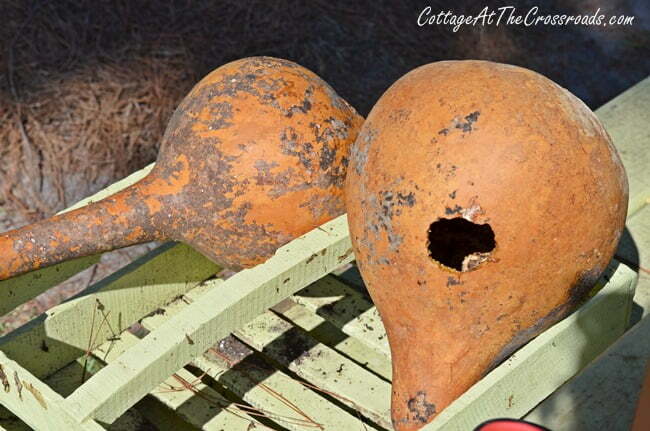 So, if you’re ready to find more inspiration for using pumpkins and gourds, just click on any of the links below! I’m ready for all things pumpkin Jane, great links and inspiration! So much awesome inspiration. Now that it’s finally cooled off here, maybe I will be in the mood for Fall! 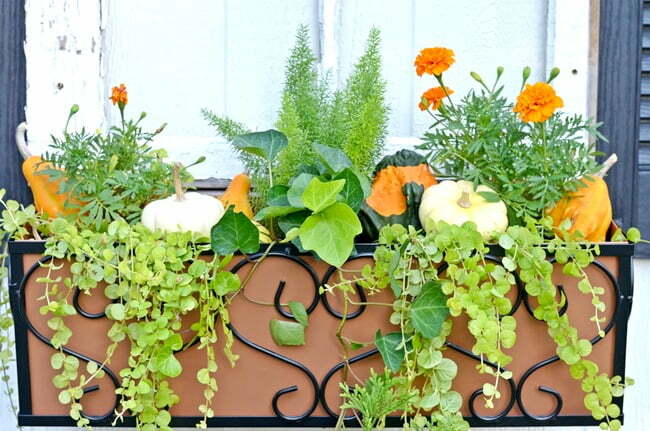 Love your fall window box! Your fall decor is beautiful. I so enjoyed reading all of the information on growing white pumpkins. My grandparents lived on a farm outside Asheville and spending summers there was so much fun. They grew many things but never pumpkins. They certainly are an effort! Thank you for sharing. It certainly makes me think they should bring more $$ than they do. 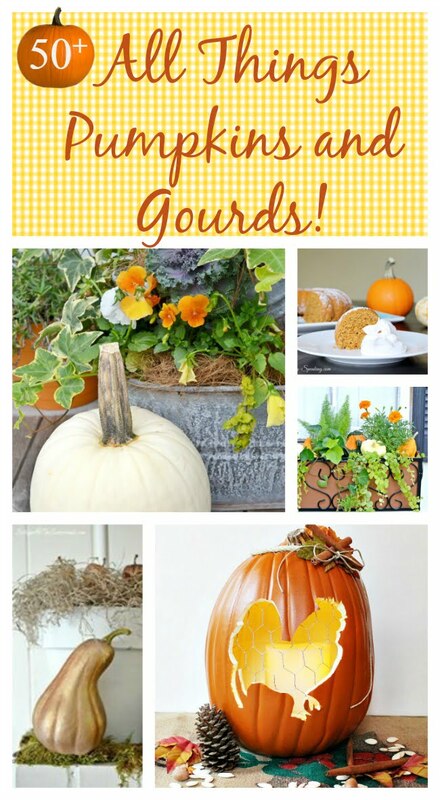 I just LOVE your burnished gourds and those white pumpkins! Pinned! Thanks for all the great ideas on pumpkins! all at my leisure! Thanks for all the good ideas! What a beautiful window box, Jane! 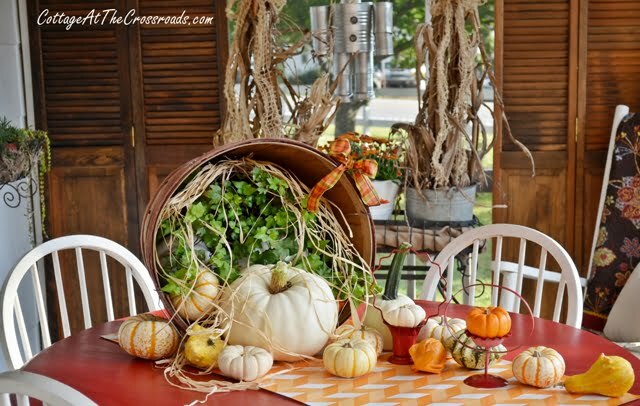 I so love all of your pumpkin and gourd decor!! !…Happy Fall!